Tonight is New Year's Eve, a traditional party night across the globe. Please party safely! If you drink, don't drive; if you drive, don't drink. It really is that simple. Even one drink can affect your ability to effectively operate a motor vehicle. Nobody wants to leave their car halfway across town and have to retrieve it the next morning, which is why the American Auto Association - AAA - offers the services of it's Tipsy Tow program. 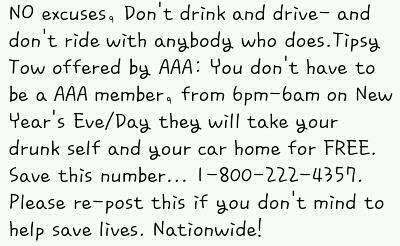 AAA members can call their provider from 6PM local time New Year's Eve to 6AM local time New Year's Day. If you are a AAA member, you can call 1-800-AAA-HELP and get a free ride home, complete with a free tow for your vehicle. Now you have no excuse to drive after drinking, or to ride with someone who has been drinking. Call for a ride! For your convenience, a cut-and-save, pocket-sized information sheet is below. Please print it out before you go out this evening, readers! Tipsy Tow is not available in all areas, so plan accordingly! If you are not a AAA member and do not seek to become one, check into the public transportation schedules in your area. Many major cities offer free rides on New Year's Eve to discourage inebriated driving. Nobody wants to start the New Year as a patient in the emergency room - or worse, as a guest of the local morgue. Take care of yourself - don't operate under the influence! P.S. Thank you to Matt G. of Oregon for passing on this important information! Net Tv efficiency Live NetTV APK and the top quality they provide to the customer. Visit here Inning accordance with me Live Net TV is a terrific Download Live NetTV streaming application that admits.